Want to have a FREE FREE ECS X79R-AX motherboard? Then here is your chance to get that superb and fast motherboard for your gaming needs. So why go for ECS X79-AX? "ECS Black X79 Series unleashes the extreme power of Intel® Sandy Bridge-E processors and breaks the limitation of your desktop computer to a height you could never dream of. ECS Black X79 Series is equipped with four PCIe Gen 3 x16 slots for 4-way GPUs supporting NVIDIA® SLI® and AMD CrossFireXTM graphics cards to construct an invincible gaming station. Also, ECS Black X79 Series supports quad-channel memory up to 64GB providing off-the-chart task processing speeds; the memory frequency support could also overclock to 2500MHz which is over 87% more than the traditional 1333MHz memory frequency." To know more about the ECS X79 series you can VISIT THIS LINK. ECS is currently raffling away an ECS X79R-AX motherboard through the ECS Philippines Fanpage. All you need to do is browse below and accomplish the requirements. These tasks includes liking the ECS Philippines Fanpage, Tweeting about it, and referring friends to the fanpage and liking it as well. You can also keep on getting points by tweeting and referring friends daily to have a bigger chance of winning. The contest duration is from Feb 14- Feb. 26, 2012. 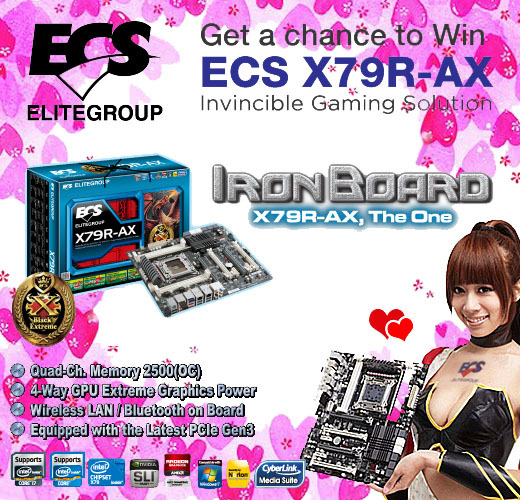 So start earning points now to get your FREE ECS X79R-AX motherboard.